It seems that yogurt is experiencing a bit of a renaissance, and small wonder: plain yogurt is a good source of protein (required in greater amounts as you age), probiotics which promote gastrointestinal health, it contains bone-healthy calcium, and is relatively low in calories. Cuisinart's electronic yogurt device (model CYM-100C)—released in 2014—promises to make home batches of plain yogurt easier to create in your own kitchen. Does it deliver? The answer is a resounding yes. If you've been making yogurt for years with a variety of brands and appliances, the Cuisinart CYM-100C eliminates some of the frustrations you may have had with other models. Most yogurt makers designed in the past for home use used small plastic or glass containers, which contribute to half-empty jars and unnecessary fridge clutter. Why not use one big canister to make and store the yogurt, allowing you to dish out as much as you need at a time? The Cuisinart yogurt maker has a 32 oz (1 liter) capacity and the BPA-free canister easily goes from machine to fridge. It can be washed in the top rack of your dishwasher. Not only is this yogurt maker attractive, its vertical design is tall and narrow rather than low and wide, occupying a smaller footprint on the kitchen counter. Compared with other models, its compact shape uses up less valuable kitchen real estate. Since fermentation time can take anywhere from six to twelve hours, calculating backward from the time you'll have to get your batch in the fridge requires a bit of math. If you begin the process at dinner time, will your yogurt be ready to refrigerate at 3 am? The Cuisinart model has addressed this brilliantly by incorporating a cooling element into the machine. If the countdown timer is set for a 9-hour fermentation period, the machine automatically switches to the cooling mode when the time is up. The machine will remain in cooling mode until you turn it off. As with other yogurt makers, purchased culture can be used as a starter. Alternatively, 1/4-1/2 cup of plain yogurt from the grocery store works, as long as there are no flavorings, syrups, fruits or gelatins added. Plain yogurt from a previous batch you've made yourself also works as a starter. Note: if you use a starter culture, pay attention to the instructions regarding preheating milk, as different starters may require specific temperatures to launch the fermentation process. I've always begun by heating milk to about 180 F (82 C) or until bubbles appear around the edge of the saucepan. I add about 1/2 cup of skim milk powder which yields a thicker texture. Once the mixture has cooled to 110 F (43 C), I add the starter, stir and transfer the mixture to the yogurt maker. Preheating helps break down the milk proteins for a smoother and thicker yogurt. However, in the Cuisinart machine's instructions, it suggests skipping this step and simply mixing the culture into a pre-measured bowl of cold milk, stirring well to distribute evenly, transferring that to the yogurt maker and setting the digital countdown timer. I was skeptical but pleasantly surprised when my batch emerged ready and done after 9 hours. Again, I used store-bought plain yogurt as a starter; a purchased starter culture may require a specific milk temperature to take effect. Because I prefer a thicker yogurt, I then strained it in a sieve designed for the purpose, manufactured by Cuisipro Donvier. Voila! Thick, Greek (strained) yogurt made at home, chilled and ready to eat. The Cuisinart instructions recommend straining overnight using a colander lined with a coffee filter, which would also work—just be forewarned that losing that much liquid whey through straining can yield something more akin to cream cheese, not Greek yogurt. The instructions also advise keeping the canister in the machine in cooling mode for a minimum of 12 hours before removing it from the device. I couldn't understand this directive and after straining it to remove some of the whey, simply transferred it into a container bound for the fridge. In its troubleshooting section, the manual suggests that if after cooling your yogurt it doesn't seem thick or tangy enough, you can return the under-cultured mixture to the device for more fermentation time. 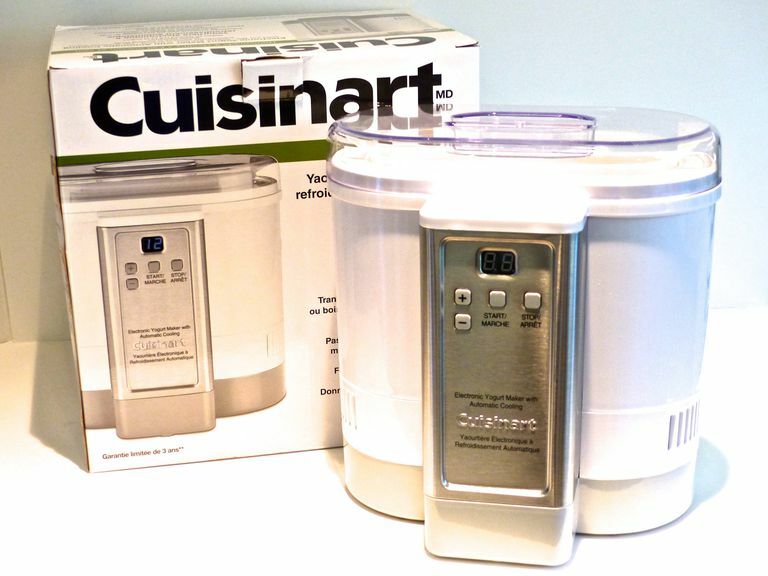 Cuisinart offers a three-year warranty against manufacturer's defects, including mechanical and electrical problems, though damage from misuse or unauthorized repairs are not covered. The Cuisinart Electronic Yogurt Maker with Automatic Cooling (CYM-100C) is a very effective and user-friendly device that deserves a spot in your kitchen cupboard. Is Frozen Yogurt Really Good for You?